The always reliable Chevy Tahoe is back and features everything enthusiasts enjoy about America's top-selling SUV - a powerful engine, spacious interior and a towing capability of 8,500 pounds. For the 2014 edition, Chevy has added an additional exterior color option and the Standard Convenience Package for all LS models. A signature bowtie reappears on the Chevy's exterior frame, with a twin-port horizontal grille and bold fog lamps firmly fitted on each end. Coated in a chrome or argent-textured finish, the vehicle is finished off with a front license plate, skid plate and recovery hooks. Power-retractable steps, heated outside mirrors and a power liftgate come standard on LTZ (heated mirrors and liftgate available on LT). Choose from 17-inch wheels (standard on LS and LT) or 20-inch wheels (standard on LTZ) for a smooth drive. Also, joining the nine-color exterior options for 2014 is Concord Metallic. On the inside, the Tahoe's roomy interior stands out, providing 108.9 cubic feet of cargo space. Springfield families will be impressed by the luggage space for family trips, removable third-row bench and the second row seating options - a three-passenger bench or two bucket seats. A powered second-row seat release is also available for LT and LTZ. For technology fans, each console is equipped with SiriusXM Satellite Radio and Bluetooth capabilities, with the addition of a touch-screen navigation radio and Bose surround sound on LTZ. A first for the Tahoe, The Convenience Package comes standard on LS and LT. Most 2014 Chevy Tahoe reviews applaud the package's amenities, which include rear park assist, rear camera, inside mirror with camera display, a remote starter and power-adjustable pedals. 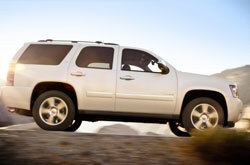 Capped off with a 5.3L V-8, the Tahoe is built to easily transport both families and cargo. For more information on the 2014 Chevy Tahoe in Springfield, continue reading below. If you've ever thought about purchasing vehicles like the 2014 GMC Yukon, Ford Flex, Buick Enclave, Dodge Durango, Toyota Sequoia and the Jeep Grand Cherokee in Springfield, compare Chevrolet's new 2014 Tahoe first; we're positive that it's ideally suited for you. 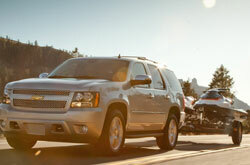 The Tahoe's superb exterior design, passenger-oriented cabin amenities and low price are sure to win over MO shoppers. Hundreds of Springfield Chevrolet drivers choose it because it's a truly amazing value; just compare its price to the vehicles in its class. For more details, check out the Tahoe's quick-facts list under this text. We've taken the time to create reviews about vehicles like the 2014 Chevrolet Tahoe because we know how important it is to your car search. There is a reason why we are one of the Springfield area's well-known Chevrolet dealerships. Just one reason is that we provide reviews authored by seasoned automotive writers. This Chevrolet review contains accurate information about the Tahoe and it's specifications, safety technologies and more. Discover all about our entire group of attractive automobiles! 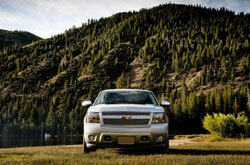 If the Tahoe isn't the right option for you, we've got many other Chevrolet reviews and car comparisons. Visit our research directory to view them now!